The UKLSA has a strong dedicated equalities division which promotes equal access to the legal profession and justice. 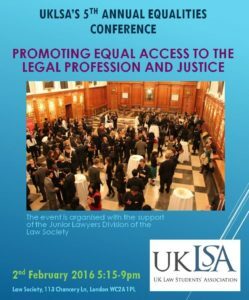 The UKLSA has regularly organised large multi-university events focusing on promoting access to justice the profession. These events have included the Annual National Equalities Conference which raises awareness of the importance of equal access to justice and the profession. Our annual conferences on equality have been sponsored and hosted by The Honourable Society of the Inner Temple, by Linklaters, by the Honourable Society of Lincoln’s Inn, the Society of Asian Lawyers, the Law Society of England and Wales and the Junior Lawyers Division. We are grateful to all our sponsors for supporting the UKLSA’s work towards promoting equal access to justice and the profession. Why do we put efforts on access to justice? “Without access there is no justice” – Mr J Knowles at the UKLSA’s 5th Annual National Equalities Conference. Do we have access to justice if courts fees are unaffordable? Do we have access to justice if courts are not public friendly e.i. courts expecting the unrepresented to comply with complex procedures, complex bundling and complex paperwork? Do we have access to justice if chances of winning are reduced for the unrepresented, thus increasing chances of them having to pay legal costs? We put a significant part of our resources to improving access to justice. This includes organising for 5 consecutive years a National conference on Equality of access. Why are we particularly concerned with equality? Equality in the legal profession not only ensures fair treatment and access to opportunities, it also ensures that justice and society are best served. To get a good understanding of equality the better place to start statistics, and where possible avoiding opinions. Some useful statistics about equality in the UK legal profession can be found in this report. Facts and figures about the legal profession. Facts and figures of diversity in the profession: read this Guardian article.